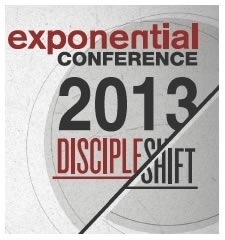 All this week, I am attending the Exponential 2013 conference, which is a gathering of roughly 5,000 church planters and leaders within church planting churches and networks. It is a great learning opportunity for me, but I also like to share what I am learning with others. As I have done in the past, I will blog regularly on the conference through the notes that I take on the sessions I attend. Feel free to comment, ask questions, and interact with these posts in any other way you would like. Would love to have been there too.